These country classic song lyrics are the property of the respective artist, authors and labels, they are intended solely for educational purposes and private study only. The chords provided are my interpretation and their accuracy is not guaranteed. Connie Smith lyrics and chords are intended for your personal use only. Conway's dad taught him chords on a small guitar when he was only 4 years old and also learned from an elderly black man who was their neighbor. Conway idolized him and couldn't get enough of his teaching. 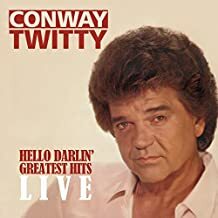 In the world of American popular music "only" Conway Twitty has had 55 number one records. For three decades he enjoyed unequaled staying power in an industry whose stars often fell as quickly as they rose. Throughout his long career he has touched almost every popular musical category of the nation including rockabilly, blues, rock'n'roll, Dixieland, R&B, gospel and mainstream country. Conway was not only a major music figure but also known as a truly honest and forthright man and put decency and dignity above all else. He was a gentleman who defined class and is sorely missed. He left us with so many great songs that will be enjoyed for years to come.